Since the girls practically lived on the bouncer I know that Baby JE will surely love to be in a bouncer too. I have changed my mind so many times on which bouncer to buy and finally made up my mind. We got this bouncer/glider for baby JE. Isn't it cute? And it doesn't seem like the baby is going to outgrow this glider too quickly. I remember with Jewelle we changed bouncer three times because she outgrew them really fast. 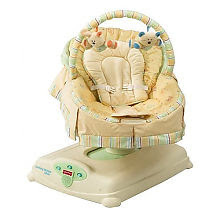 The headrest being adjustable makes it easy, too, for when the baby's sleeping or awake. I think this will be Baby JE's favorite place to sleep lol.